Deep Extreme Indonesia 2019 features one of Miguel’s Diving staff as guest speaker. Our senior dive master and marketing assistant Yunis Amu participated in UW Talks. These talks featured various Indonesians well known in the dive industry. We are very proud that he received this invitation. In his UW talk, Yunis targeted divers who use only automatic settings when photographing underwater. He challenged them to advance their skills and use manual settings. This would give much better results in underwater photography. After introducing himself, he divided his UW Talk into several sections. First was Aperture or F-Stop, then Speed and then ISO. He included a section on Strobes and ended with cautions about Buoyancy. To support his UW Talk, he shot a variety of marine life common in Gorontalo. That included Salvador Dali sponge, red sea whips, Thorny seahorse, lionfish, Harlequin ghostpipefish and sea fan. These he shot at various settings to illustrate the impact a change of settings would have on a particular photo. 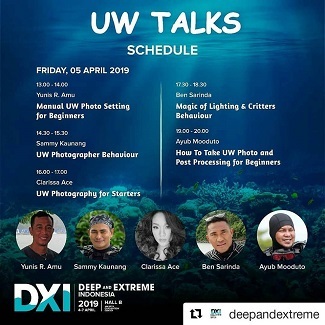 He completed this UW Talk for Deep Extreme Indonesia 2019 with several dramatic and excellent photos. These included a rare bell jellyfish, nemo and nemo eggs, whale shark in sunburst and seahorse shot with black background and bokeh style. All underwater photographs presented were original and without any computer editing. Miguel’s Diving has participated in this annual dive expo since its inception. Deep Extreme Indonesia certainly maintained its reputation as a well-run, regional dive expo this year. The variety of exhibitors is one of its hallmarks. Two of Miguel’s Diving staff attended the expo and promoted diving in Gorontalo. Meanwhile back in Gorontalo, our staff hosted international divers, providing great service and great diving. This included five whale sharks and 35 meter visibility! For your chance to study underwater photography in Gorontalo with our staff, please book your dive trip with us!